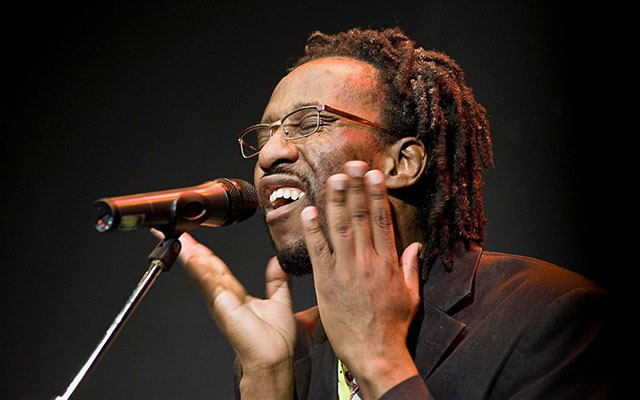 At first blush, it is tempting to draw comparisons between Gino Sitson and Bobby McFerrin. Yes, there are similarities in their approach to “vocalastics”, but more important than these similarities is the fact that their music comes from the same place: the soul. Now here are some elemental differences. Gino Sitson is constantly weaving in and out of European classical polyphony that seems to come from the 7th to the 19th centuries classical music; most important among the classical influences is the fact that almost all of his music seems to float and weave in and out of operatic arias, which melt into a musical web of African polyphony. Another important facet of Gino Sitson’s singularity is the fact that he has the vocal range from counter-tenor and a quite extraordinary one at that. 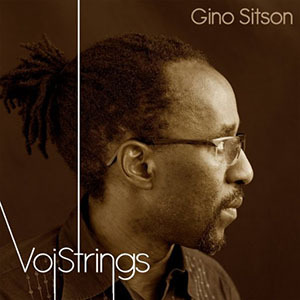 On VoiStrings Mr. Sitson energising precision is infectious and he is served by an illustrious team of soloists including bassist Lonnie Plaxico, pianist Helio Alves and the silvery cellist Jody Redhage, among others who, together explore music with vocals to the sound of strings for melismatic and colouristic good measure. Spurred on by this fabulous group of musicians, Gino Sitson brings all of his élan, intelligence and passionate engagement to the repertoire here that is like an elegant and enchanting railway system linking classical, jazz, folk, African and European chamber music styles. But to describe it as such gives the impression of overcooking when in fact the whole project is a masterpiece of subtlety. And Gino Sitson crystal clarity runs the full gamut from the aching lyricism of “Nda Yahwe” to the elated peroration of “The Gathering”. Throughout this fantastic musical sojourn his accompanying musicians to word and situation through-composed in operatic fashion with meaning dictating structure rather than vice-versa. For this reason, these songs deserve wider exposure—in the form of a recital perhaps. Through all of this Gino Sitson breathes an air of sheer genius into the wonderful repertoire of this musical project. If you are swept away by Gino Sitson’s extraordinary talent, you might easily forget the repertoire evokes atmospheres of longing, sorrow, joy and nostalgia. Universal emotions are at work here; even if you leave aside some universal theme aside, you would still find something on this CD to enjoy, discover or identify with. This is due in no small measure to the fact that Gino Sitson’s singing is eloquent indeed. His voicing is expertly balanced in “Let’s Do It” as well as in “Bulawoyo Xmas”, and of course in “VoiStrings” and its bookend, “VoCello”. The phrasing in all of the songs “sings” wonderfully. Mr. Sitson’s voice is high, delicate and otherworldly. This is music that really gets under your skin. It is expertly conceived and crafted and vocalastically a performance of exceptional polish, authority and conviction. This CD is one to absolutely die for. Tracks: Let’s Do It; Nda Yahwe; Bulawoyo Xmas; Salam Salem; Beu nen’; Up Eye; Suite for John; Youp Kwi; VoiStrings; Timeless Mood; Élégie Opus 24; Genou; Maiden Voyage; Katcha; VoCello; The Gathering. 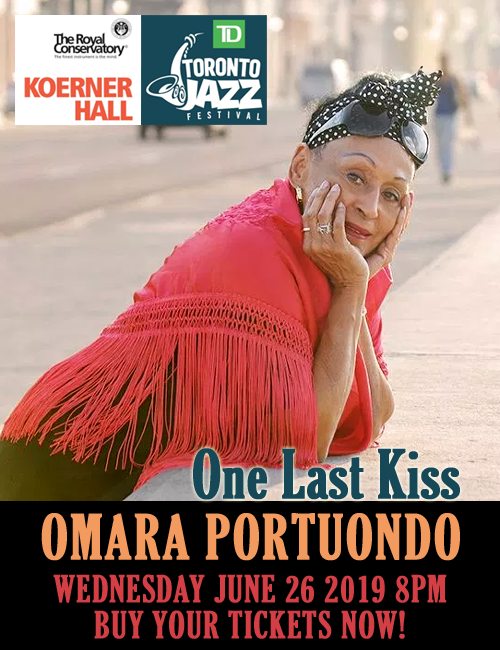 Personnel: Gino Sitson: lead vocal, percussion, vocal instruments, miscellaneous vocal effects, body percussion and backing vocals; Helio Alves: piano; Lonnie Plaxico: double bass; Willard Dyson: drums; Jody Redhage: cello; Lev “Ljava” Zhurbin: viola; Charenee Wade: voice (13).